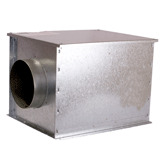 A pollen filter unit, equipped with an F7 grade filter to provide a huge reduction in allergen and dust entering the home. Ideal for allergy and asthma sufferers. The filter in the unit requires replacing every 3-6 months to prevent performance issues.